J: There is more to a Friday night than getting fall down drunk. If one walks about this great city of ours one could have an enjoyable evening for very little money. After a trip to National Geographic’s IMAX theatre for a viewing of The Wildest Dream, seeing that frosty topped mountain gave me the ice cream urges … to Beacon Drive-In it was for our fill. We weren’t prepared to do any reviewing this night. On our way home, the moon was shining our way to the nearest bus stop. But before we reached that destination, Ed and I did the mid-step pause. There was a new establisment in the old Crystal Gardens building. It looked small and the bright neon open sign was inviting. 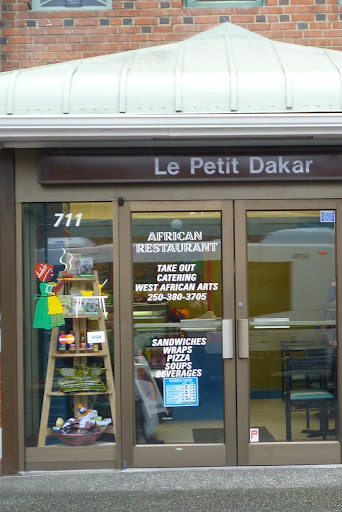 E: Le Petit Dakar beckoned the both of us in. This little eatery was a perfect way to end the day, and I couldn’t decide on what spicy delight to partake in. After looking at the menu, I got the sense that most of the tastes are from the north western to north eastern region of Africa (but I could be wrong), and after James said the magic word, I took a chance at the Saka Saka ($8.75) to shake the cold away. I asked for hot sauce as a side while James didn’t go for any. J: And I stand by my decision. The dish was already spicy enough and after seeing you remove your jacket only to keep dripping behind ther ears, I know I saved myself from embarassment. But you had that refreshing Bissap drink on hand. It had just the right meeting of cranberry and ginger. Our Saka Saka was nice although some areas of the rice was a little dry. But I had no other complaints. E: I found the rice to be oddly mushy. That may be a result of the microwaving, which I heard beeping behind me, as our meals were being prepared. Normally, I frown on this type of rice preparation, but on a late night, I can’t fault the operation for a last minute accomodation. I’d have to revisit this place to see how their rice is kept during a normal business day. The toppings, however, were delicious. The lamb was very well done (no reheating required) and the casava leaves was a new taste to me. It had a nice deep earthy flavour that I really liked. The salmon wasn’t too bad either, and there was minimum bonage to be found—even though we were warned that there may be some in the dish. And this meal was one I could not finish. The portion size was huge. J: Our host was very gracious and I enjoyed her company. She had this warm smile that allowed us to enter into a comfort zone that one normally experiences at home. When you find a place where the owner has great people skills, you’re already ahead of the game. This business is her dream and I sincerely hope she keeps it. This entry was posted in Food, Reviews and tagged Breakfast, British Columbia, Downtown Victoria, Inner Harbour, Lunch, Middle Eastern. Bookmark the permalink. ← "I’ll Have a Pound of Ground Beef and a Dance Number Please"
Great review! I love Bintou and Petit Dakar! I always go here for Tilapia and Acheke being a fan of very hot food…its a treat on an evening before heading out on a night of binge drinking.